b. June 24, 1930, Paris, France. Along with François Truffaut and Jean-Luc Godard, Claude Chabrol’s name is famously associated with the path-breaking criticism of Cahiers du Cinéma and the rise of the French New Wave. But whilst Truffaut and Godard saw themselves as auteur and innovator, to survey Chabrol’s long career is to see a craftsman productively immersed in the conventions and compromises of mainstream filmmaking. 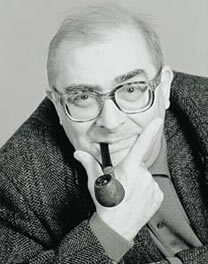 Born in Paris in 1930, Chabrol was evacuated during the Occupation to the Creuse department in the Massif Central. Growing up in the village of Sardent, he and a friend set up a makeshift ‘cinema’ in a barn. 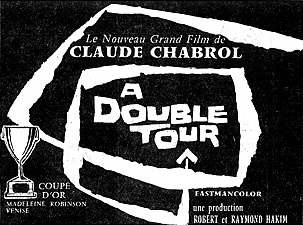 Playing the roles of programme director, exhibitor and projectionist, Chabrol got around the German prohibition against Hollywood by advertising German genre movies as American “super-productions.” Returning to Paris after the Liberation, he began attending the thriving postwar ciné-clubs and cinémathèques where he met Truffaut, Godard and Eric Rohmer. An ardent fan of Fritz Lang and Alfred Hitchcock, he was invited to contribute articles to Cahiers. Lang and Hitchcock would have profound influences upon Chabrol’s own films. From Lang, he derived a sense of cinematic space, the relationship of image to narrative, the prospect of entrapment. From Hitchcock, he derived a sense of irony, the relationship between guilt and the individual, the prospect of murder. Supporting himself by working at the Paris publicity office of 20th Century-Fox, in 1957 Chabrol and Rohmer published an influential book on Hitchcock. 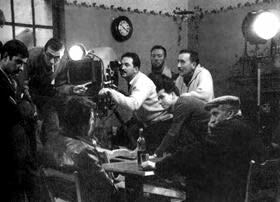 Returning to Sardent the same year, Chabrol shot his first film – Le Beau Serge (1958) – with an inheritance from his first wife. Chronicling a young man’s return to the village where he grew up and his encounter with a now dissolute and alcoholic friend, Le Beau Serge is considered a founding moment of New Wave cinema. Simple and direct in its account of youthful lives unfolding against a rugged landscape and cast with unknowns, the film’s mastery of story and image is typical of Chabrol. For Sight and Sound, Le Beau Serge was “a film cut out with hatchet blows.” Again featuring actors Gerard Blain and Jean-Claude Brialy, Les Cousins (1959) traced the fortunes of a pair of Parisian students, one from the country, one from the city. Another detailed portrait of youth, the film is suffused with Chabrol’s own preoccupation with the interaction between decency and flaw in an imperfect world. In an intricate sequence of events, Les Bonnes femmes (1960) charted the dreams of four Parisienne working girls. The film’s feeling for human foibles coupled with ironic detachment are key to Chabrol’s perennial elaboration of bourgeois morality, moral compromise, murder and guilt. Les Bonnes femmes closes with a young woman in a dance hall accepting an invitation to dance from a man whose face we do not see. Over his shoulder, she smiles and the camera tracks out to reveal a globe, spinning and glittering above them. Leaving the woman to what may be a pathetic fate, and apparently content with a world that continues on its way, led critics to charge Chabrol with apathy. But, as Tom Milne argued in 1970, a true cynic would not consider the world’s daily course even worthy of comment, so universal is pathetic fate. Such is the essence of the critical dispute over Wilder that raged in the 1960s and 1970s. But, given the widespread decline of religious faith in the 20th century, both directors seem equally attuned to protagonists compromised in a world in which notions of right and wrong have become relative rather than absolute. Given the unpredictability of experience without propositional revelation to guide us, Chabrol seems to suggest, the woman’s optimism could be well founded. 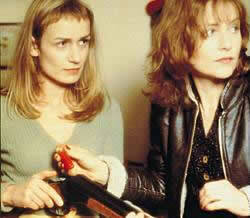 Seen by this light, Chabrol’s country cousin becomes corrupted by circumstances rather than by an ‘evil’ cousin. The schoolteacher in Le Boucher (1969) becomes ‘guilty’ of harbouring the killer not because it is a sin to kill, but because, in this instance, the innocent schoolteacher could not help feeling for the killer. Like Wilder protagonists mired amidst the contingencies of an imperfect world, Chabrol’s inhabit a universe consisting not of blacks and whites but of shades of darkness and light. Related to Chabrol’s moral detachment, Richard Combs observed in 1987, there are moments of caricature, even vulgarity, in Les Cousins, as there are in 1960s Wilder projects such as One, Two, Three (1961) and Kiss Me, Stupid (1964). Traditionally, the theatre has been frowned upon for its moral ambivalence. But Chabrol and Wilder too share a feeling for reality’s masks, and, as in Some Like it Hot (1959), there is the air of theatre about La Decade prodigieuse (1972). Chabrol and Wilder revel in stories about detectives tainted by what they detect. Blood Relatives (1977), like Double Indemnity (1944), features an investigator irrevocably tainted by what he uncovers. With those swooping tracking shots of the lovers strolling through poppy fields in A Double Tour (1960), Chabrol also parodies traditional romanticism. Wilder too seemed to desacralize Hollywood romanticism in that assignation in Double Indemnity, awash with Schubert’s Unfinished symphony. Stylistically classical in an era of modernist flourish, Chabrol and Wilder are realists whose work embodies the moral tone of its time. Attempting to root Le Beau Serge in an extreme realism, Chabrol’s camera respects Sardent’s topography as it follows characters clear across the village. You are reminded of that famous drunken odyssey down Manhattan’s Third Avenue in Wilder’s The Lost Weekend (1945). If works like Marie-Chantal contre le Docteur Kha (1965) and La Ligne de demarcation (1966) now appear to lack Chabrol’s distinctive stamp, even the very titles betray a lack of moral complexity. Built upon the customary tension between ethically light and dark characters, Chabrol has called Les Biches (1968) “the first film which I made exactly as I wished.” Taken to St Tropez by a beautiful and sophisticated woman she meets in Paris, a young woman becomes caught up in a shadowy menage-a-trois. Les Biches is often seen as the film in which Hitchcockian Chabrol; “an elegantly detached, ironically poised camera which reserves all judgement to itself”, as Combs put it, gave way to Chabrol’s penchant for Lang’s geometric play with narrative space. To French writers, Fritz Lang’s films defined theoretical issues relating to space and the shot by situating themselves at the limits of classical practice, thus defining its norms. Lang’s Hollywood films at once mastered and exceeded the studio style. Lang captured the sense of a modernist cinema by reflecting upon what classicism had made possible long before the revisionist modernisms of the 1960s. As Chabrol’s colleague Eric Rohmer wrote, “Lang’s films embody the precise example and the most demanding conception of [what we mean] by mise-en-scene.” Distrustful of the ‘New Look’ of Antonioni and his imitators, Chabrol now employed a camera style that did not simply make an issue of his distance from trapped and fraught protagonists, but added, through his manipulation of space, fresh conditions for their destiny. As a respectable citizen vows to kill the driver who killed his son in a hit-and-run accident, Que la bete meure (1969) continued Chabrol’s exploration of the primeval ‘beast’ which lurks beneath the veneer of bourgeois civilization. As Phil Hardy wrote in Time Out, “so much of its meaning is contained in the camera’s perspective of what happens rather than simply what happens.” Continuing the chronicle of bourgeois decline, in La Decade prodigieuse a young man (Anthony Perkins evoking Psycho‘s (Alfred Hitchcock, 1960) dysfunctional Norman Bates) has lustful feelings towards his mother while watched by Orson Welles’ God-like paterfamilias. Combining the characteristic trap of Lang with the confessional mode of Hitchcock, Les Noces rouges (1973) was a tongue-in-cheek political thriller which satirised Gaullist aspirations in a year of national elections. It came close to being banned. Written by and starring Chabrol collaborator Paul Gegauff, Une Partie de plaisir (1974) was based upon the break-up of Gegauff’s own marriage and stars his wife and daughter. It is one of the most harrowing of Chabrol’s films. In 1963 appeared Chabrol’s study of the infamous French poisoner Landru. In 1978, Chabrol returned to the theme in Violette Noziere, tracing the fate of a young woman who, in 1933, poisoned her parents. Isabelle Huppert’s fragile beauty adds to a pantheon of delicate Chabrolian roses from Audran onwards and the film won her the Best Actress award at Cannes. Among the several Chabrols in which Huppert has appeared is La Cérémonie (1995) in which the director’s eye for social and psychological nuance finds ample expression in a Brittany village disrupted by the unholy alliance between a postmistress and an errant housekeeper. In L’Enfer (1994), Paul (François Cluzet) follows his wife in Chabrolian fashion across a little town. Passing a church, a wedding procession swoops through the open doors. Based on a film begun by Henri-Georges Clouzot but never completed, L’Enfer builds a dark tale of sexual jealousy from a succession of small but disturbing details. In 1990 appeared Docteur M, Chabrol’s tribute to Lang and a compelling though difficult meditation on contemporary morality shot in a Berlin on the verge of reunification. Highly regarded as one of French cinema’s elders, Chabrol has worked with many of the best actors and technicians of the postwar period. 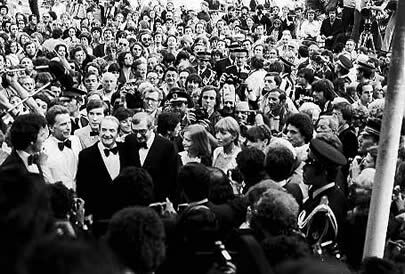 Although occasionally contentious – Une Affaire des femmes’ account of wartime Vichy French collaboration led to violent protests when it was released in 1988 – his work seldom generated the cinephiliac excitement attending Godardian experimenta, or drew the devoted crowd that followed Truffaut. Yet, for Ginette Vincendeau, the bulk of Chabrol’s work elicits “a comfortable ‘quality’ which is…far from unpleasurable.” The best of them belong in a pantheon alongside vintage Lang and Hitchcock. This piece is due to appear in the Wallflower Critical Guide to European Directors and we gratefully acknowledge the co-operation of Wallflower Press. 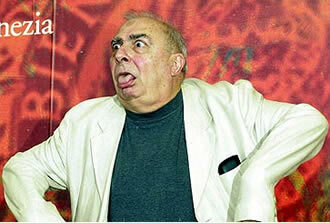 Flickhead’s own Chabrol resource page. Several here. Just scroll down. Reviews of Le Boucher, Une Affaire de Femmes and La Cérémonie.